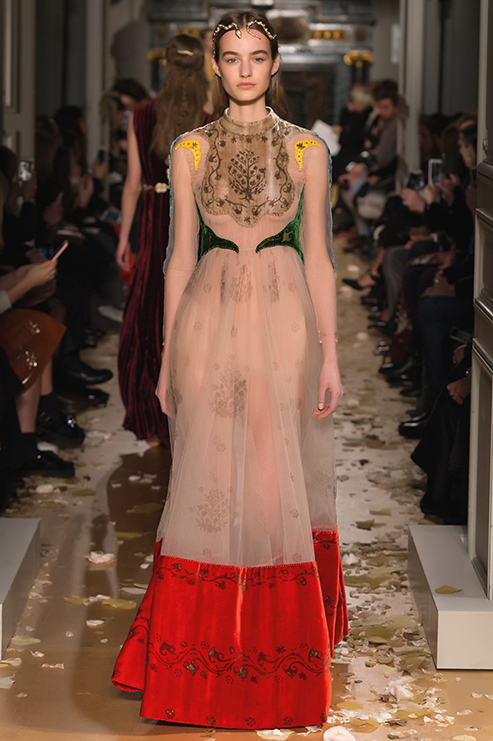 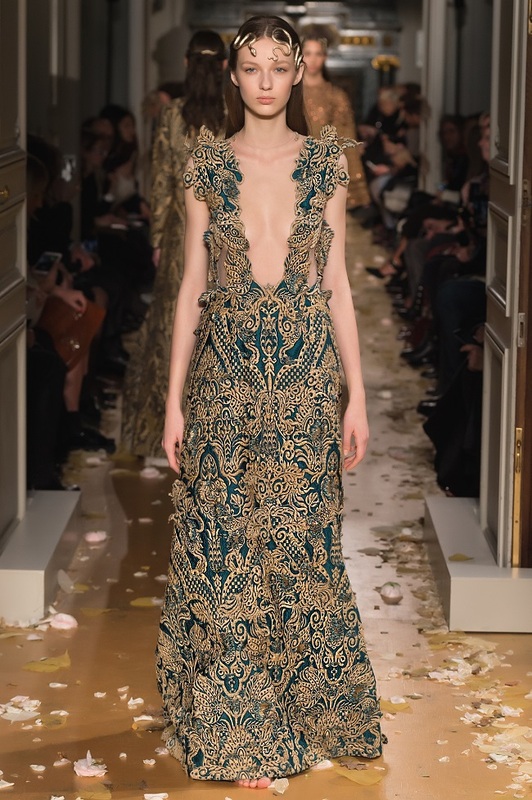 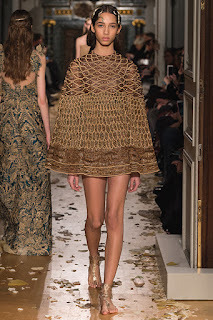 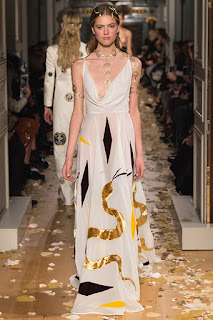 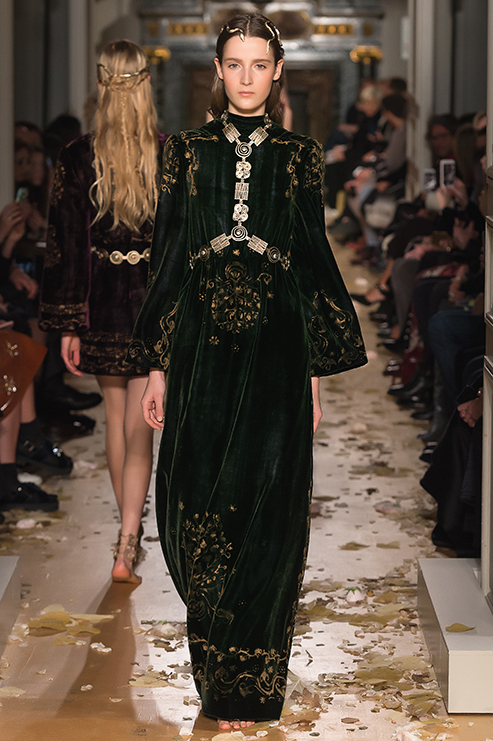 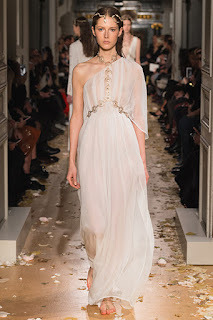 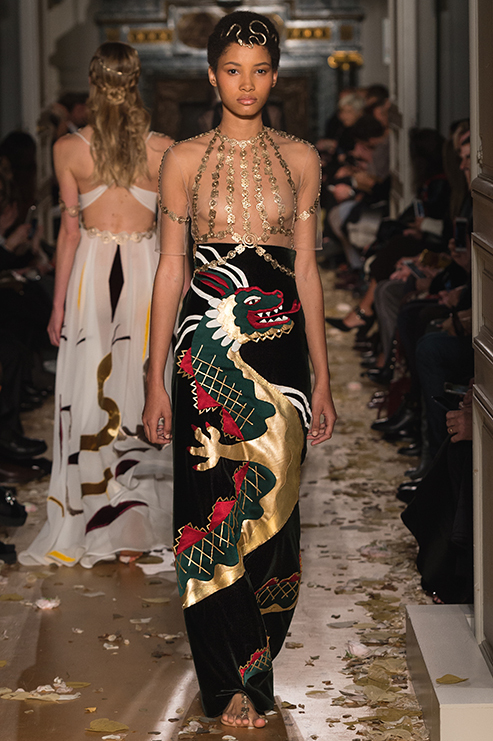 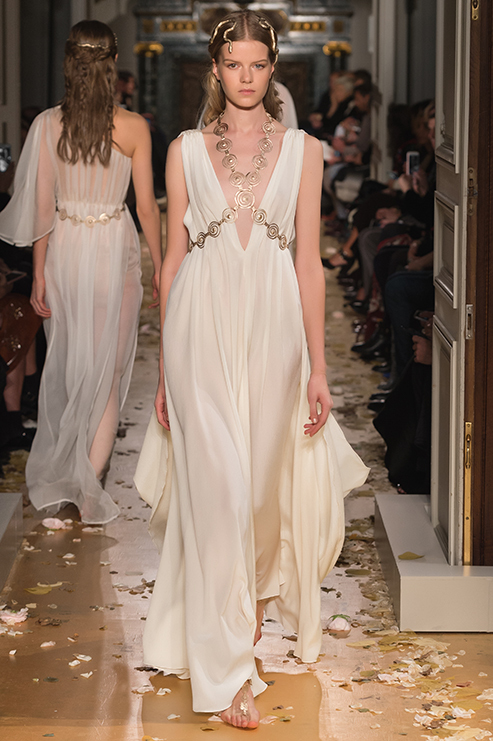 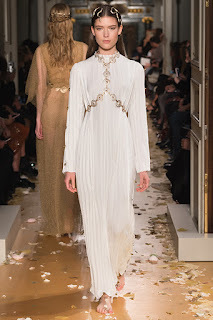 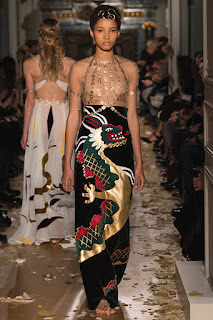 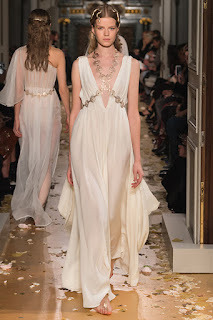 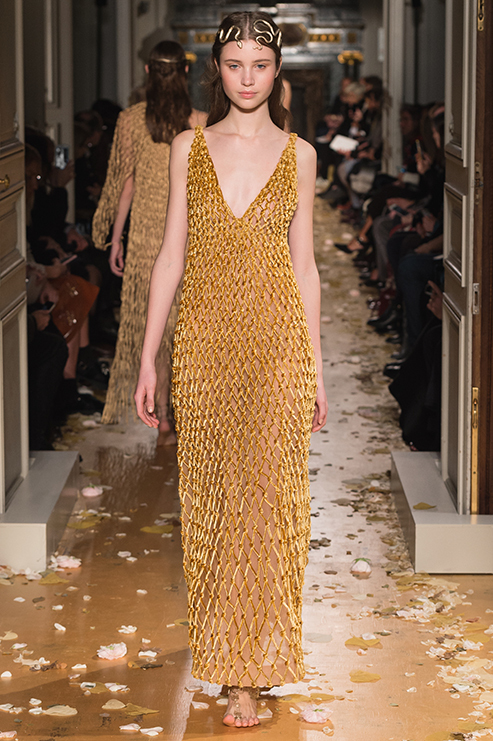 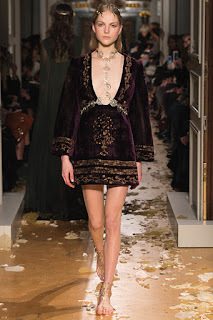 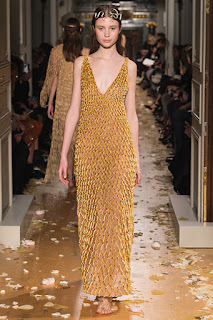 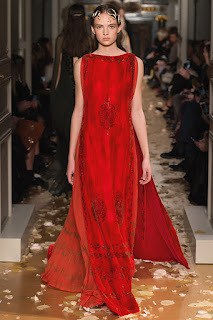 VALENTINO SS2016 Haute Couture Collection is about body, movement and beauty. Time as a value to explore and as a horizon on which to flutter. 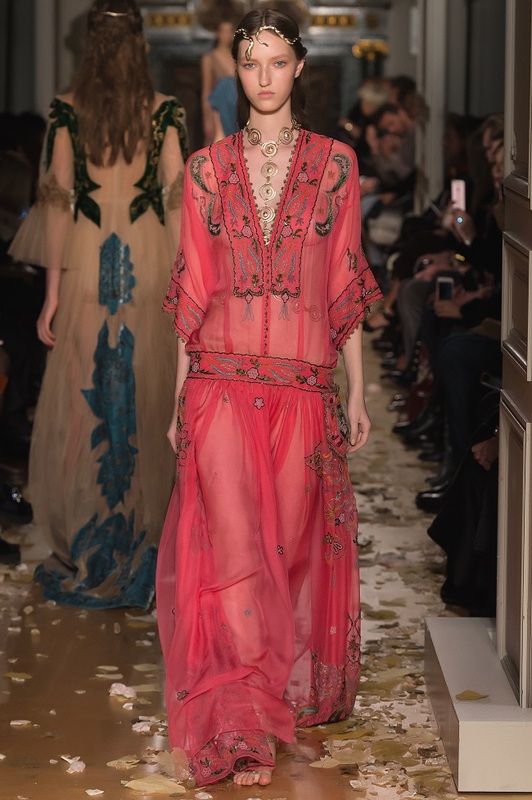 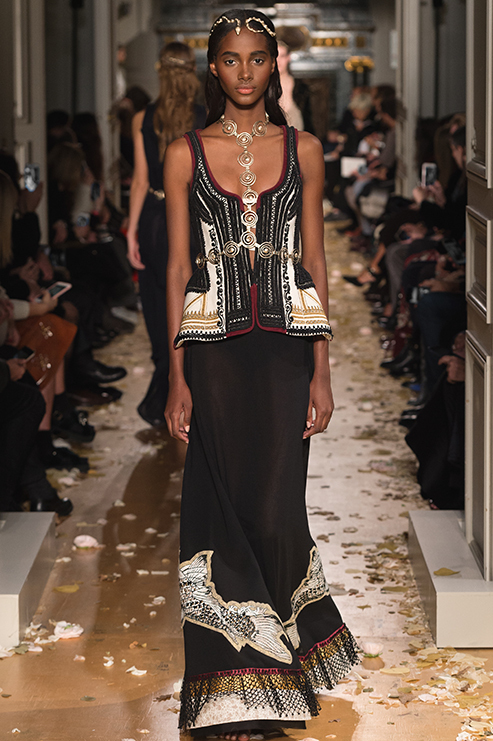 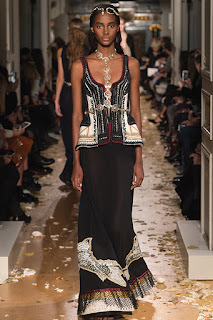 Maria Grazia Chiuri and Pierpaolo Piccioli imagine a collection with a lyrical touch, for the Valentino SS2016 Haute Couture collection. 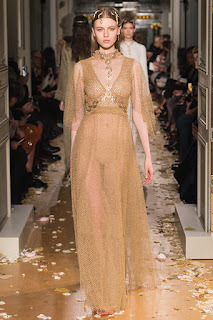 Convinced that Haute Couture must live beyond the syncopated rhythms of fashion, in order to express long lasting values with thoughtful lightness, they start from the body, which is no longer the object but the subject, as a source of formal research, which creates a subtle and individual beauty. 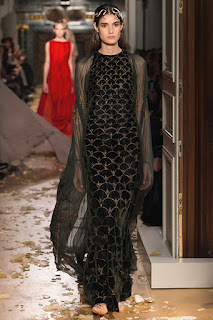 The woman is the protagonist of the narration. 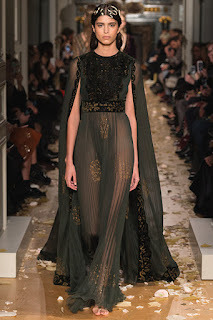 Free in her gestures and in her thoughts. 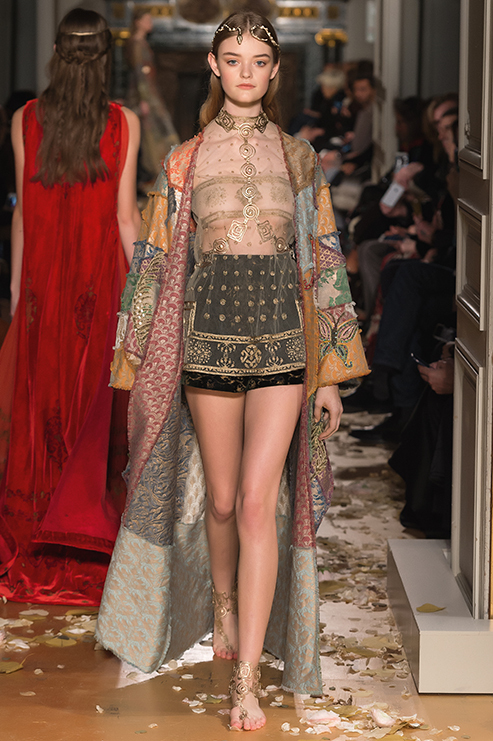 Barefoot, in order to find an earthly contact, which is the most realistic and personal form of inner balance. 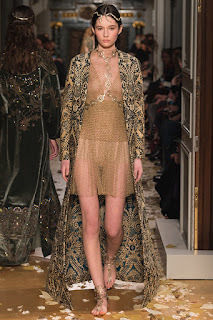 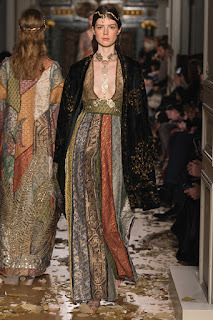 In this journey the Creative Directors look at the figure of Mariano Fortuny: the alchemist who manipulates light in order to fix eternity, the artist on the borderline between Eastern Byzantine and Western Classic, who creates the modern dress, the delphos, grasping the impulses of progress in the recesses of tradition. 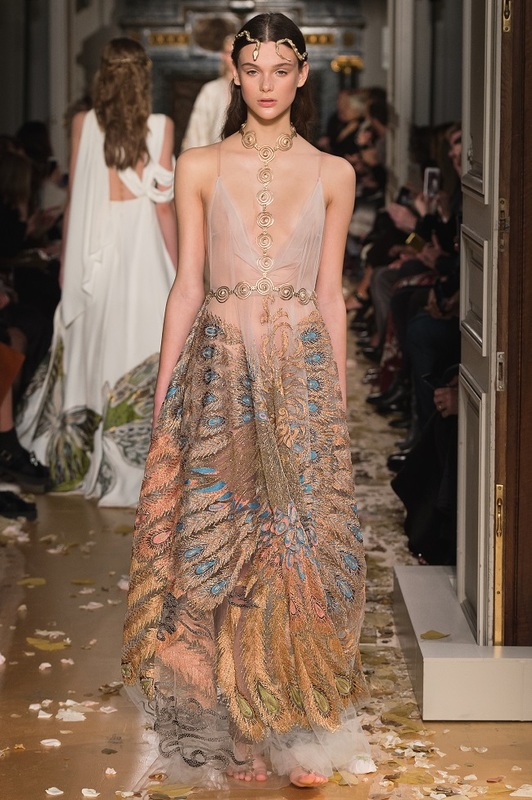 In a composite yet natural choreography, Fortuny is surrounded by a crystalized gallery of characters whose research on freedom of gesture springs from a profound notion of the female physicality freed from cages and constraints: ballerinas Loïe Fuller and Ruth St. Denis, but also Isadora Duncan and later Martha Graham. From the reconquest of the body established by these artists, Maria Grazia Chiuri and Pierpaolo Piccioli capture the absolute, sensational modernity: the desire to knock down structures and cultural obstacles for a return to nature. 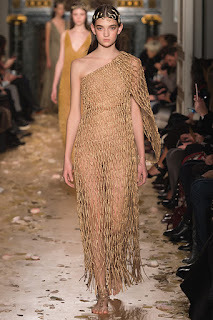 The collection has a vertical and airy approach. Worldliness thickens on the surfaces: tattered touches on velvets, pleats exclusively handmade as if ready to melt away, patchwork composed of opulent weaving, animals and hand-painted volutes. 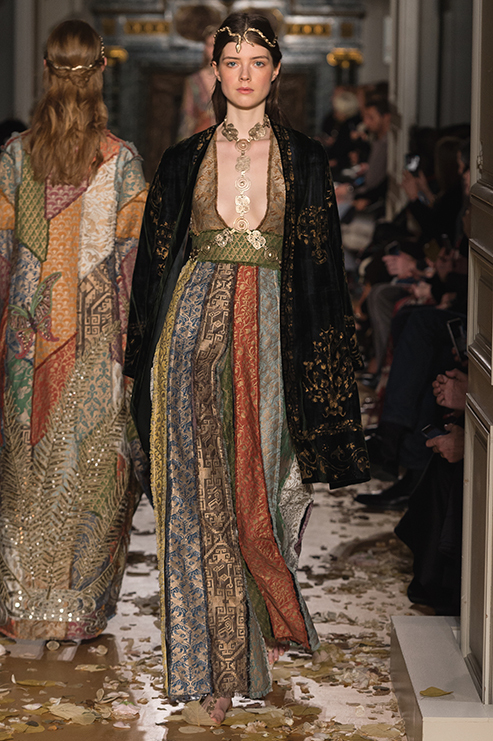 The tactile richness derives from a collaboration with the textile archive Fortuny. Purified orientalism becomes precious Byzantine or explicit japonisme in kimono style coats, in carps and dragon patterns painted on long robes. 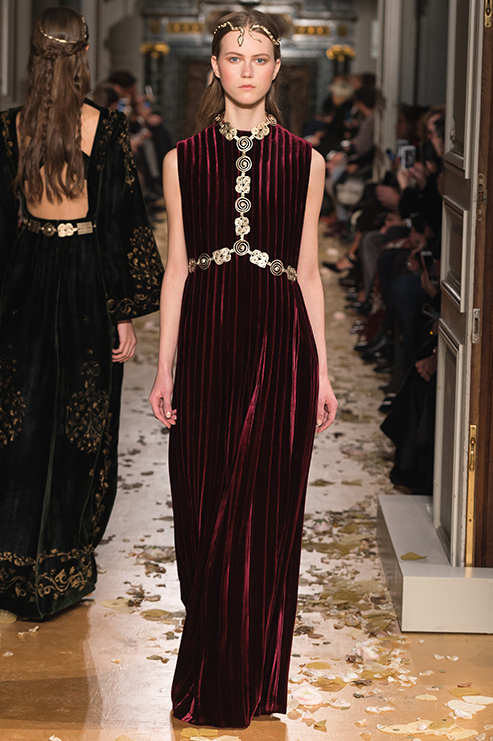 The shapes are fluid, consistencies are impalpable: overlapping tunics, pleated velvet delphos, column dresses with intangible consistency. 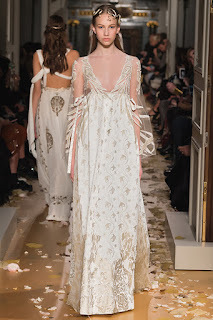 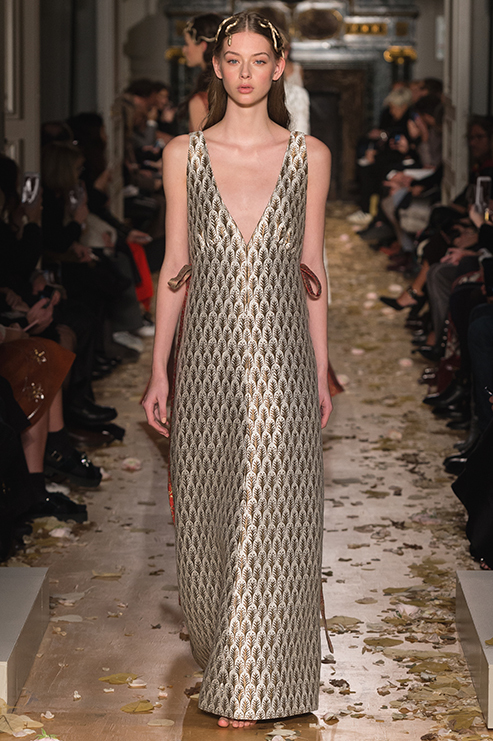 Lightness suggests movement, barely fixed by embroideries which overlap with patchwork and pleats. 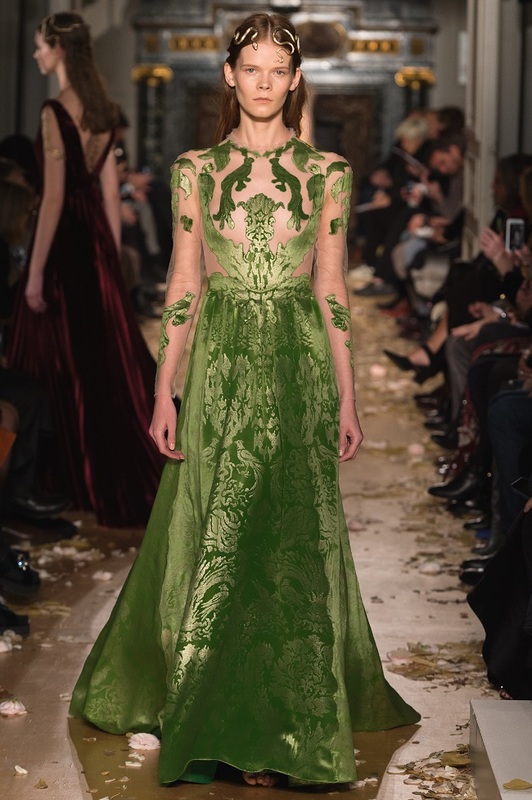 A patina made of a human and touching imperfection pervades all, in a harmony of delicate colours that thicken in tones of green, red, all the way to black. 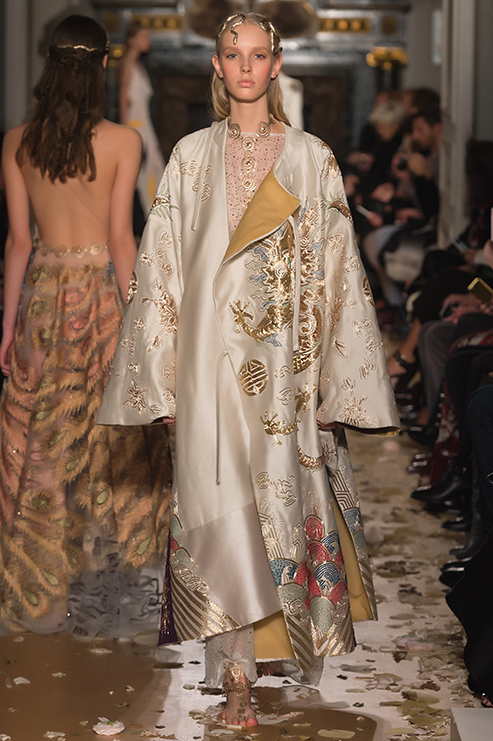 The ethereal image is spangled with statement jewelry by Alessandro Gaggio and Harumi Klossowski.